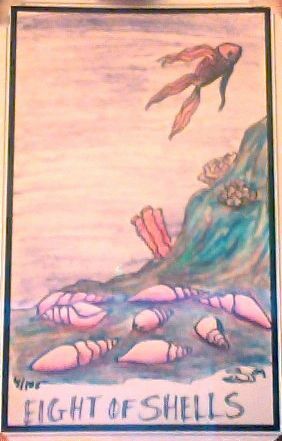 Today's Draw: The Eight of Shells from the Fishy Tarot by Beth Seilonen. Is it time for you to move on in some area of your life? Can you give up the comfort of the known and surrender to the unknown? Or are perfectly happy camping out where you are right now? It always amazes me how the same themes will recur in a week, even though I choose randomly from a different deck every day. Of course it shouldn't amaze me. Tarot does that. Occasionally, when I'm doing a reading for myself and don't like a card, I'll choose another. Most of the time the other card I choose will have a similar message. It's like the cards are saying "if you didn't hear me straight the first time, I'll say it again." 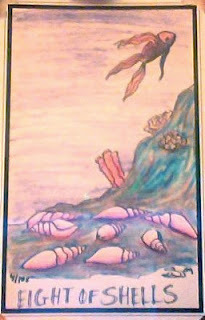 The Eight of Shells (Cups) talks about walking away without turning back. It's time to leave a situation that is no longer bearing fruit. Time to move out of our comfort zone, surrender to life's cycles and move forward in our evolution. This is a card of letting go, similar to others we've seen in the past week, but with its own unique thrust. Usually the way this card is depicted, the person walking away is trudging or of solemn stance. And in this card, as you can see, the little fishy is belly up (heehee). Often times, this card will refer to leaving a romantic or relationship in which you've done all you could. Or it could be about leaving the predictable and comfortable cycle you're in to reach for something new. Or it could also signal that every last ounce of fight or energy is gone from you in a particular dynamic. But this departure doesn't have to be a sad thing. As tarot folks know, the very next card in this story is a happy, happy wish card—one of success and accomplishment. So why so glum, chum? You're moving on to a better place! You may not know that now, but at least make space for the possibility of that in your heart. The universe has always has your back before. Another part of what I like about this card is that, when the fishy was with his shells, he was in a sort of underwater valley or trough where the current couldn't get to him. And now he's surrendered to floating up into the flow and go where the current takes him. Which brings me back to "walking away without turning back". Looking back and maintaining attachments, is not letting go. Letting go means Letting. Go. Complete surrender. Our finny friend isn't belly up because he's dead or even dead inside. He's just surrendering and keeping his eyes toward the light. This all makes me think of when I quit smoking 8 years ago. I had struggled for years to quit. I justified my addiction. I lived in denial. I made excuses. I fed my victimhood and helplessness. But it wasn't until I made a *decision*...a decision to walk away and never indulge my destructive behavior anymore...that I quit. And you know what? All of a sudden, quitting was easy. People always say you can't quit until you're ready. And I'll add to that and say you can't quit until you're ready to never smoke again. Non-smokers might not see the distinction, but smokers will. Quitting means never smoking again, just as walking away means never turning back again. There's nothing wrong with camping out in the comfortable valleys of life. But the only way to progress is to leave it all behind and surrender to the risky and unknown. To answer my own questions, there are a couple of growth areas I'm ready to surrender to right now, and one comes in the realm of emotion, requiring me to break camp in a spot I've been clinging to for a very long time. So, tell me: Is it time for you to break camp, too?